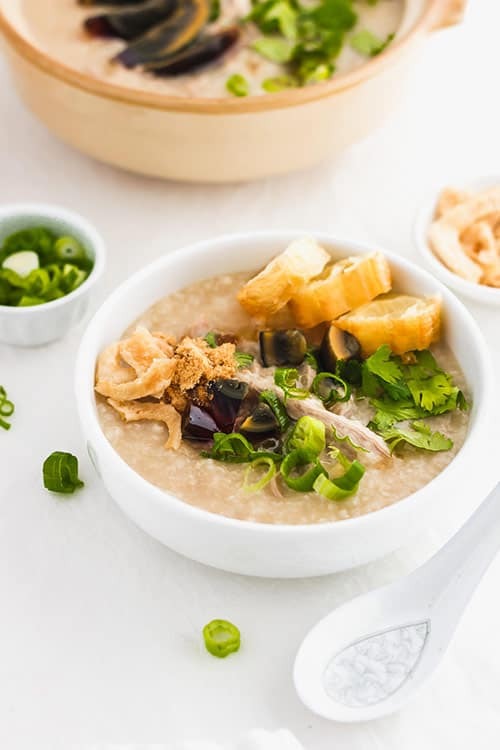 Chinese Congee is a warm and comforting rice porridge. Preserved century eggs and pork, make this pork congee recipe a flavorful, savory dish with hints of salt from the century eggs. 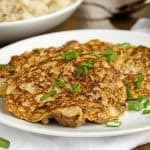 There are some foods that are reserved for total comfort. For some people, that may be mac and cheese, others, soup; but for me, it’s congee. Growing up, congee wasn’t a staple in my home, since my Dad isn’t a fan of it. He generally doesn’t like soupy, runny textures. But my Mom grew up eating it quite a bit, and so whenever I’d get sick, she’d make congee for me. Ever since, I’ve always associated congee with comfort. My husband also loves congee, but tends to only get it at Chinese restaurants. That’s because his favourite style of congee is Preserved Century Egg Pork Congee. The other day we were at dimsum, and along with our order of Chinese staples such as har gao, siu mai, and cheong fun, my husband ordered Preserved Century Egg Pork congee, and sent in the order. The order slip came back and he noticed it didn’t include the congee, so he flagged down the server and mentioned that she must’ve missed the order on the flip side of the paper. She laughed and said, it’s only available after 10:30am; the master chef isn’t in yet!! I looked at my husband and joked, “so who’s making the food now?” HAHAHA. I saw how disappointed he was in not getting his congee, so I told him I’d go home and make it for him, since I knew I had preserved century egg in the fridge. WHAT IS PRESERVED CENTURY EGG? Preserved century egg is also known by different names: 100 year old egg, 1000 year old egg, millennium egg, black egg, and a whole host of others. It is usually a duck egg, that is preserved in ash, clay, salt, quicklime and rice hulls for an extended period of time. The egg yolk turns into a dark green/grey colour and becomes very creamy during the curing process. The egg whites turn a translucent dark brown/black colour with a texture similar to jelly. Well-preserved eggs will have beautiful snowflake or pine-branch patterns on the surface of the egg, which are formed by salt crystals. According to Wikipedia, it is likely that this way of preserving the eggs in an alkaline clay mixture, was used in order to to protect and cure the eggs, making them safe for consumption later on. 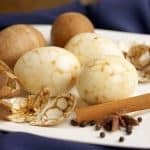 And, it’s noted that the discovery of this method of curing eggs was most likely made during the Ming Dynasty, more than 5 centuries ago, when a homeowner found a lake of duck eggs covered in slaked lime during the construction of his home. He tasted the eggs and and found it needed salt, so he set up production and added salt, which resulted in the recipe for the century egg. 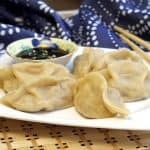 HOW IS PRESERVED CENTURY EGG EATEN? Century eggs are peeled, rinsed and can be eaten without much preparation. They are very salty, so they should be paired with something else. Various ways of eating century eggs include: pairing it with pickled ginger, with chilled tofu, with vegetables, or with freshly made egg omelette. Another common way of eating preserved century egg is in jook, or congee. Congee, or “jook” in Cantonese, is a simple rice porridge made with rice and water. 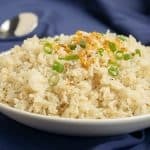 Rice is cooked with a large amount of water until the rice grains are broken down. It is easily digested and is suitable for people will illnesses or young children. 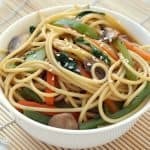 It is eaten as a staple breakfast food in China, and is often served with preserved veggies, dace, bamboo shoots, meat, or century eggs, along with yu tiao, which are fried long Chinese donuts (you can pick these up at an Asian supermarket usually in the bakery or dim sum section). 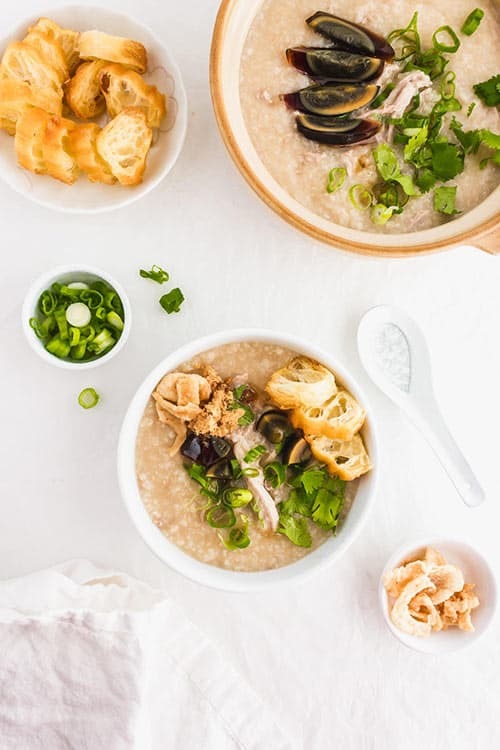 The consistency of congee can be thick or watery, depending on how you like it. 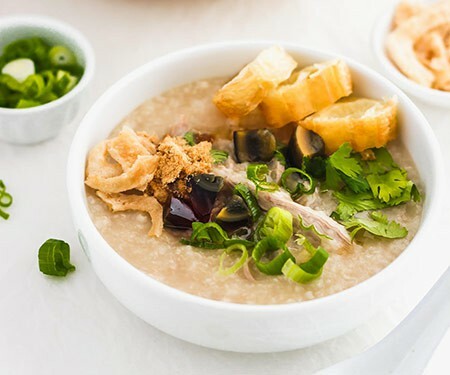 My version is on the thicker side, made with chicken broth which gives the congee additional flavour, and a little more of a beige colour, compared to if it’s made with water, which will yield a whiter congee. 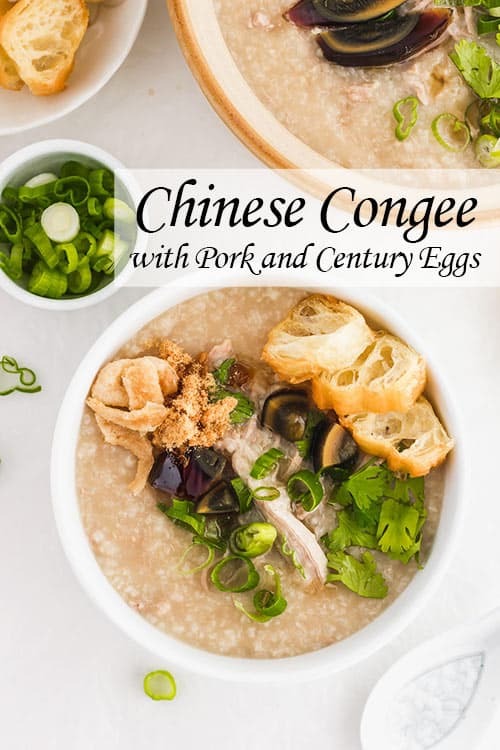 Pork congee is my favourite way to consume preserved century eggs. 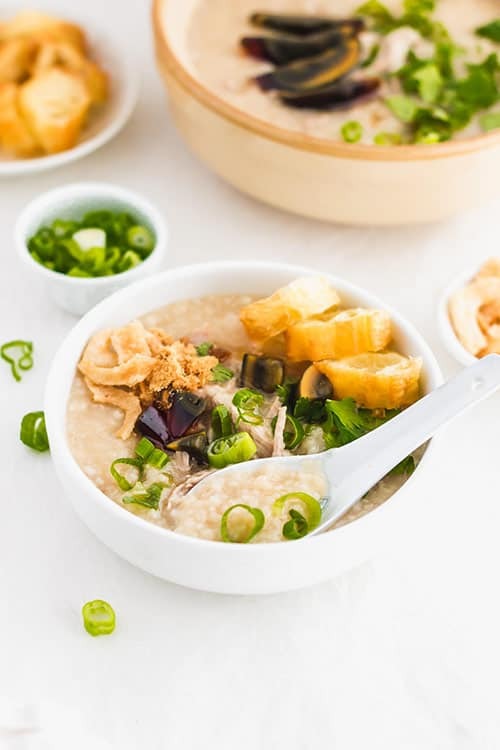 The savoury, smooth and creamy rice “porridge” gets hints of salty and unctuous preserved egg, and is balanced with the sharpness of green onion, and fried crispy yu tiao. 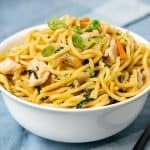 The next time you’re feeling under the weather, try this dish and you’ll be comforted by it’s warmth and wholesomeness. 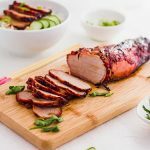 Marinate the lean pork with soy sauce and sesame oil. Set aside. In a large pot, add the cooked rice, grated garlic and ginger. Cover with water/chicken broth. Bring the mixture to a boil and then reduce to a simmer. Cook the congee for about 1.5 hours, stirring intermittently, until the rice grains have broken down. Add more liquid if the consistency is too thick. About halfway through the cooking time (about 45 minutes in), add in the lean pork and 1 of the cut-up century eggs, and continue to cook. Again, check the consistency of the congee -- add more liquid if it's too thick. When the congee is almost done, remove the pork and shred it thinly. Add the shredded pork back into the congee. Season with salt and white pepper to taste. Remove the congee from heat and ladle into bowls. Top with garnishes such as additional century egg, green onions, cilantro, sesame oil, fried onion, and pork floss. Serve immediately with freshly fried yu tiao. 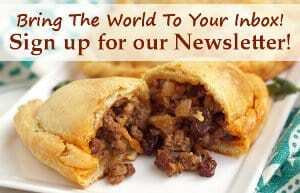 *Preserved century eggs, pork floss, yu tiao can all be found at your local Asian grocery store. 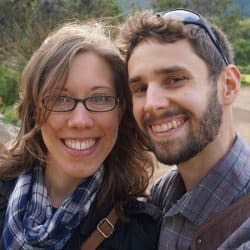 Michelle enjoys learning and discovering different foods from around the world and recreating them in her own kitchen. She is an avid matcha lover and believes that the best food is made from scratch. 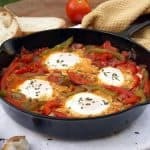 Michelle develops and photographs recipes at her blog Sift & Simmer.